I first met Wolfgang Puck in 2002. My brother and I visited Los Angeles that year and Spago, Wolfgang’s flagship restaurant, was at the top of our dinner list. Whenever I visit a new city, my first order of business is to figure out where I’m going to eat. I’m not a guy who eats to live, I live to eat. Being the food lover that I am, a dinner at Spago was sure to be memorable. But the most memorable part of that night didn’t have anything to do with Spago’s salmon pizza that Wolfgang made famous, even though it was one of the best things I’d ever eaten. When my brother and I left, Wolfgang happened to be standing at the front door where he shook our hands and thanked us for stopping by for dinner. I thought it was pretty cool that Wolfgang was there considering how much business success he’s had. I mean, it’s not like he needed to be at the front door of his restaurant shaking hands. The following night, my bro and I went to another one of his restaurants, Chinois on Main, in Santa Monica. (Like I said, I live to eat.) Much to my surprise, Wolfgang showed up to the restaurant that night as well, and it made me wonder if he had made copies of himself like Michael Keaton’s character in Multiplicity. It seemed the guy was everywhere: shaking hands, talking with guests, and checking on his chefs and managers. Four years later I moved to Santa Monica and became a regular patron at Chinois. During those first few years I frequently saw Wolfgang in the restaurant and we’d make small-talk as he moved from table-to-table, conversing with his guests and staff. By this time he knew I was a trainer of some sort. I’m sure that didn’t impress him much because, as I found out later, he’d worked with dozens of trainers during his 30 years in Los Angeles. Most of them made him feel worse than when he started. Eventually he’d heard from enough people that I was pretty good at what I did. So one night he sat at my table at Chinois and told me that he’d recently had hip replacement and feared he would have to stop skiing, his favorite sport since childhood. I was confident I could help him, and we set up an appointment so I could give him an assessment. After I assessed him, I took him through a circuit of exercises that focused on restoring his strength, endurance and mobility. He liked how the workout made him feel, and committed to working with me over the next few months since he wanted to try to ski that winter. Over the course of those next few months people began to notice that Wolfgang looked different. He was leaner, he moved better, and he was more energetic. Wolfgang didn’t want huge biceps, or six-pack abs, or any of the other aesthetic qualities that most of us are after. He just wanted to be able to ski again. That winter he called me from Colorado and said that he couldn’t remember the last time he felt so good skiing down the slopes. Now, back to my passion for food. Think back to the last time you decided to get leaner. If you’re like most people you probably bought a book that consisted of a 12-week training and nutrition plan. As you flipped through the book the workouts might have looked doable enough. But I’ll bet that the nutrition plan left you unsatisfied, even before you cooked the first meal. You can only eat flavorless food for a few weeks before the wheels start falling off the nutrition bus. There are two types of cookbooks. One is filled with recipes from famous chefs that contain meals frighteningly high in fat, sugar and calories. The other type of book – a diet cookbook – is full of recipes that are void of any of the flavor and satisfaction you need from food that you actually want to eat again. If there’s one thing I know for sure: Wolfgang knows how to make food taste great. So a few years ago I approached him about the idea of making a book of recipes that contain less fat, sugar and calories than most famous chefs usually put on the bookshelves. My timing was good. Since the time Wolfgang hired me to get his body back on the slopes he had been experimenting with many of the dishes he made famous: adding more vegetables, taking out some of the sugar, and including more healthy fats. He wasn’t interested in creating a bunch of “diet” recipes, he just enjoyed the challenge of figuring out how to make healthier dishes taste great. And man did he succeed. 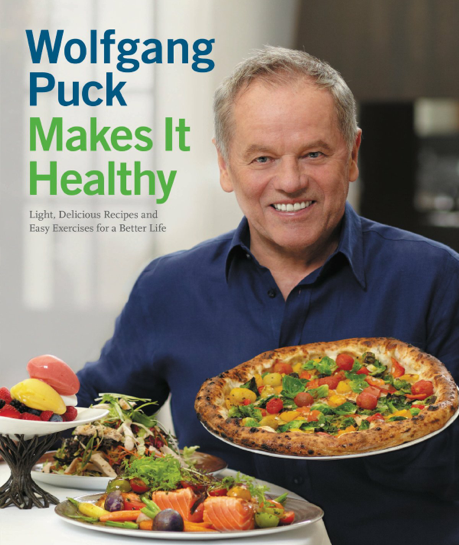 I’m excited to announce the latest cookbook to his collection, Wolfgang Puck Makes it Healthy. It contains over 100 new recipes, along with tons of tips and tricks to get the most flavor out of your healthy food. This is not a 12-week diet plan, it’s a book full of recipes that you’ll want to eat for a lifetime. Here’s a recipe you can try at home the next time you want an omelet. 1. Whisk together the egg whites, egg, and a little salt and pepper to taste until well blended and slightly frothy. Set aside. 2. Heat a 10-inch nonstick omelet pan over medium-high heat. Spray lightly with nonstick cooking spray. Add the asparagus, snow peas, and shallot and sauté, stirring continuously, until the vegetables are bright green and tender-crisp, 2 to 3 minutes. Transfer to a bowl, cover and keep warm. 3. Wipe the pan clean with a paper towel. Return it to medium heat and spray again with cooking spray. Add egg mixture, grasp pan by its handle, and start shaking the pan back and forth while stirring the eggs slowly with the back of a fork, gently lifting and moving the cooked egg so the liquid egg slips beneath it. After about 30 seconds the egg will have formed a uniformly cooked but still fairly moist pancake shape. 4. To fold the omelet, immediately tilt the pan to about a 45-degree angle by raising the handle, so that the cooked egg nearest the handle begin to fall and fold; you may use a fork or a spatula to help this happen. Hold the far edge of the pan over a heated serving plate and continue tipping the handle up, so the omelet folds over on itself and rolls out onto the plate. 5. To fill the omelet, use a small, sharp knife to cut a shallow slit lengthwise through the top of the omelet though the upper layer of egg. Spoon the reserved sautéed vegetables into and spilling out of the slit. Serve immediately. The book also contains exercise information that I wrote with Lou Schuler. The workout plan contains of circuit-training routines that build strength, endurance and mobility for people over 40. The training plan is also excellent for those with little training experience and minimal home equipment. If you’re a health-conscious food lover that enjoys cooking, this will be the best $27 you’ll ever spend. You can find it at all major bookstores, or on Amazon at the link below.